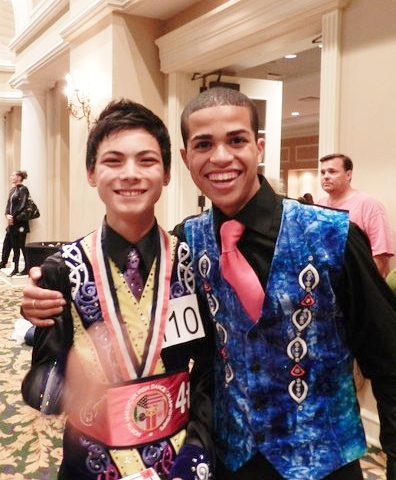 I recently had the honor of interviewing seventeen year old Champion Irish dancer, Drew Lovejoy. Drew dances for the McGing Irish Dancers in Cincinnati, Ohio, and has been dancing since he was six years old. Although everyone knows Drew Lovejoy as "Drew", he shared that his full name is Terrance Andrew Lovejoy. He has always been called Drew though. Drew said his mom has a few nicknames for him, but like any mom, she has special privileges, and is the only one who can use them. In interviewing Drew, he comes across as a really humble, down-to-earth, young man, who doesn't easily bring up his many accomplishments in the world of Irish dance. He was unable to compete at the 2012 World Irish Dancing Championships in Belfast, Northern Ireland this last April due to an adjudication issue. This happens every year to a select group of Irish dance schools. 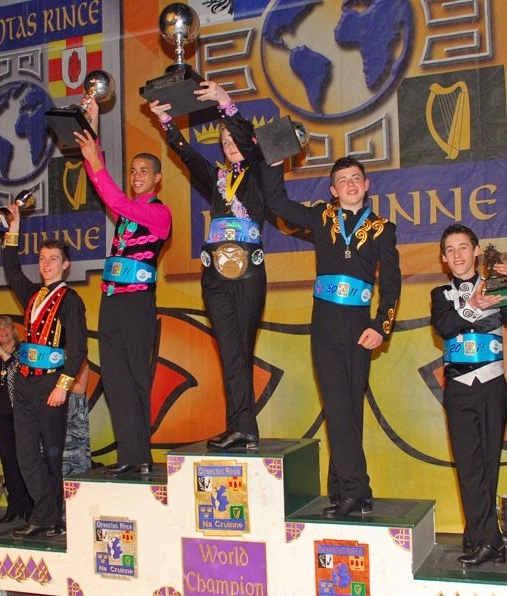 However, the last three major Irish dance championships that Drew has competed in, he has won. He came in first place at the 2011 North American Irish Dance Championships, the 2011 Middle America Regionals, and the 2012 All Ireland Irish Dance Championships. The biggest win for Drew was the 2010 World Irish Dancing Championships in Glasgow, Scotland. I have done "20 Question" interviews with other Champion Irish dancing boys and young men before, but this time, I polled the moms of Irish dancing boys on the "Moms to Reel Boys" Facebook page. The moms and boys were all very excited about this interview with Drew. Many of the questions came directly from them. DMW: In a few words can you tell us why you started Irish dance? 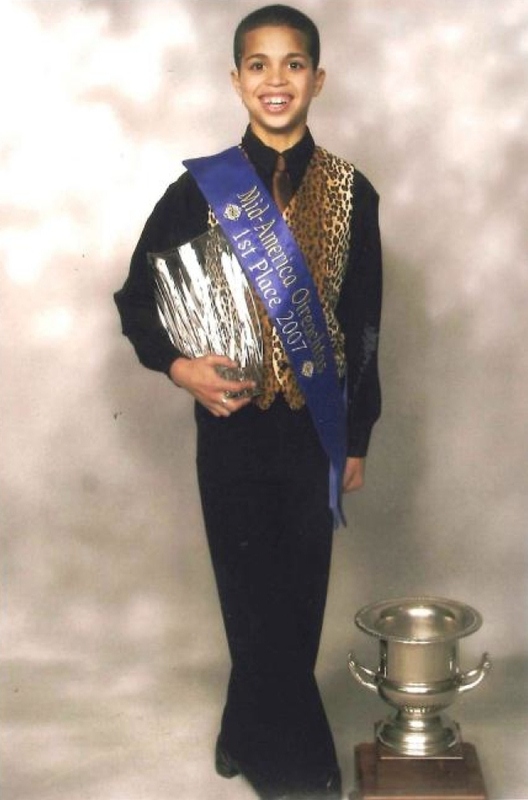 Drew: I went to the Indianapolis Feis to watch a friend compete when I was 6 years old. When I walked in and saw the boys dancing, I told my Mom that I wanted to dance. I started beginner classes that Fall and the rest is history. DMW: Do you have any men in Irish dance that you've looked up to or seen as role models? Have you gotten to meet any of them? Drew: I have several role models: Terry Gillan, John Timm, Michael Holland, Craig Mason are just a few that have inspired me. I am lucky enough to say that I know all of them very well. One of the great things about Irish dance is how kind and generous the community is. I have been fortunate to meet so many people that inspire me in different ways. DMW: What is your current Irish dancing goal? Drew: My goal is to continue to improve my technique to become a stronger and better dancer. I want to continue to place well and training and practice are the key to that. I hope that I can continue to make my teachers and family proud. DMW: Any goals for the future that include Irish dance when you're an adult (teaching, performing with a professional group, doing your own thing)? Drew: I can’t imagine not having ID in my life. I plan to sit for my TCRG and eventually my ADCRG. Before that I hope to audition for a professional troupe. DMW: I see that you graduated a year early from an on-line high school. Can you tell us a little about your educational experience-- why you or your mom chose homeschooling, anything about your early graduation, and your plans for any further education?? Drew: My family chose for me to attend an on-line, public e-school because the education is wonderful. It also offered me the flexibility to travel overseas for Majors. I did graduate a year early. This was my decision and my parents supported me. I combined my Junior and Senior year of high school because I wanted to take the next step in my education and I felt that I could handle the extra pressure that graduating a year early put on me. I am happy to say that I graduated with high honors. I plan to attend college in the fall in Cincinnati while I continue to dance and compete. DMW: What is your greatest accomplishment in Irish dance? Drew: I’m pretty proud of the wins that I have, but honestly I would say that my greatest accomplishment in Irish dance is all the amazing friendships I have been able to maintain. DMW: What is your best or funniest Irish dance memory? Drew: My best Irish dance memory is when I won the 2010 World Irish Dancing Championships. It’s also my funniest memory because we had added the scores wrong and thought I had placed 2nd. My Mom and I were already celebrating the fact that I was on the podium for the first time when the totals were announced. Needless to say, we were surprised and shocked but incredibly happy and super excited. DMW: I have heard from several people who've met you and competed against you that you are a gracious and friendly person- even in the heat of competition. Is there anything or anyone you can credit with your good attitude and good sportsmanship? Drew: My teachers expect all of us to be good sports, but I would have to give the credit to my Mom. She has always taught me to keep a positive attitude no matter what comes my way. She also instilled in me from my first feis to be a gracious winner and a gracious loser. She has always told me that I may have a great day, but someone else may be even be better so I need to appreciate the judge's decision and keep my head held high. DMW: Can you tell us about any friendships you've made in Irish dance? Any international friends? Close friends you've made through Irish dance? Drew: I have made so many friends in ID. Some of my closest North American friends are in Chicago, New York, and Connecticut. I am very good friends with several of the boys in my competition group. Richie Murray, Eoghan Murphy and Michael Gardiner are all from Ireland. They are 3 tough competitors, but as soon as we are off the stage we have a great friendship. I am thankful for their support and we are able to keep in touch between Majors through Facebook. DMW: What is your favorite feis to compete at other than majors? 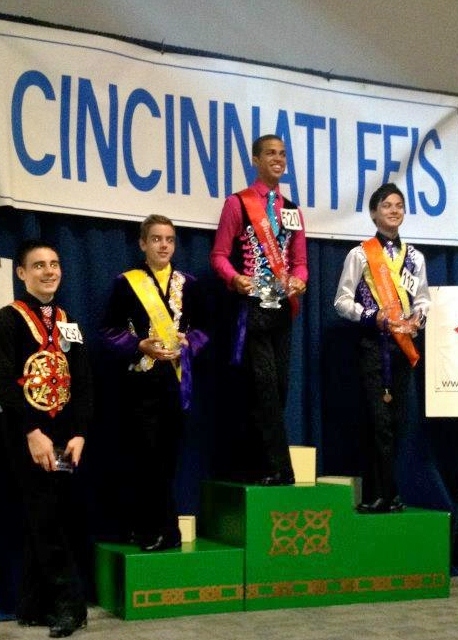 Drew: The Cincinnati Feis. My school hosts the feis and I love volunteering after I’m done competing. DMW: What is your current set dance or favorite set? Drew: My favorite set that I have done is The Piper at speed 76. Although the set I’m preparing for NANs is fun and I can’t wait to dance it. DMW: Can you tell us about who made your vest? Did you design it? Drew: My vest was made and designed by Gavin. DMW: What brand of hardshoes do you wear? Do you do anything interesting to them to make them more comfortable or to break them in? Drew: I wear Rutherford wide hardshoes. I do have a system to breaking them in and once I put new hardshoes on my feet, I never go back to my old ones. For me, the best way to break them in is to wear them. DMW: Any injuries that have made you stop or slow down in Irish dance? If so, how did you treat that injury-- any special exercises that you've needed to do to strengthen that area? Drew: I did have a pretty serious injury in 2010 and missed dancing at my Oireachtas. I did everything my doctor said and listened to my teachers. When I came back, I did a lot of stretching and used therabands to regain my strength and flexibility. DMW: How often do you practice, and for how long do you practice? Do you have a place to practice in your home, or do you have somewhere that you go to practice? Drew: I have class 4 days a week. Each practice is between 1 ½ hours to 3 hours. I cross train 2 days a week. I do have a practice space in my hometown. My podiatrist that has been caring for my feet for the past 7 years let me build a large stage in the basement of his practice. If the weather is bad or I am unable to attend class, I will go down there and drill and practice. I am usually there for around 2 hours. DMW: Is there anything special you do as far as nutrition or diet? Drew: I used to be a lot stricter about what I eat, but I have relaxed a bit. I do my best to stay away from sweets, soda, and fast food. I try to eat mostly lean meats, vegetables, and fruits. I also use protein shakes in between meals. I was diagnosed last year with hypoglycemia, low blood sugar, so I have to eat around 7000 calories a day as well as take my medication. DMW: What is your favorite Irish dance CD to practice to? Drew: I can’t pick a favorite. There are just too many great musicians out there. I like to change up what I practice to that way I can prepare myself for the different musicians' styles. DMW: Other than Irish dance music what is your current favorite song or artist to listen to? Drew: I like anything with an upbeat tempo. I listen to a lot of Eminem, Carrie Underwood, LMFAO, Maroon 5, and Chris Brown. DMW: Do you do sports or any other forms of dance? Drew: I like to play basketball, ultimate Frisbee, and football. I don’t play any other organized sports because I drive 2 hours each way to dance class so there isn’t time to be part of a team. Also, I don’t feel that I would have the results I have if I played other sports. DMW: Any cross-training or exercises you do on a regular basis to improve your Irish dance, flexibility, and stamina? Drew: I work out with a trainer 2 days a week. I started using him about 4 years ago to keep my strength while I was going through an injury. I do a lot of running, crunches, foot work, and stretching. Also I just started using the insanity dvd’s. They’re amazing! DMW: What is your best advice for boy Irish dancers who are wanting to become champion level dancers? Drew: Keep working hard and listen to your teachers. Dedication is also the key to success. Drew: When I grow up, I want to be a good husband and father. I also want to make a difference in a child’s life. I wouldn’t be who I am without the amazing teachers I have had, and I hope to honor them and pass along everything they have taught me to the next generation of Irish dancers. DMW: Thanks so much, Drew! I wish you much success in your upcoming competitions, and I can't wait to see how you do at the 2012 North American Irish Dance Championships in Chicago! Are you or your child competing at the 2012 North American Irish Dance Championships in Chicago, Illinois? What day will you be there? Good luck to all of the competitors!